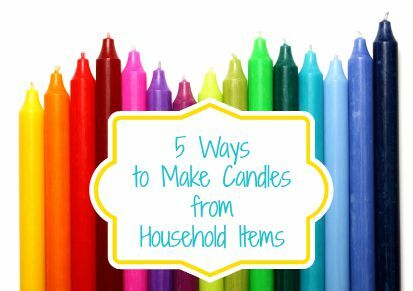 Here are five creative ways to make candles using household items to help keep the lights on when the lights go out. Finding a wick may be your largest challenge. You can purchase wicks in bulk to have on hand in the event that a disaster occurs, or find a suitable alternative. Whichever alternative wick you choose to use, ensure the wick is a suitable size to burn the candle. Further, remember to prime the wicks by soaking them in melted wax and stirring for a minute or two and allow to dry. This makes the candle burn more efficiently. When placing the wick in the melted wax, be very careful not to burn yourself. Tying the wick to a pencil that will sit on the top of the container or mold is a good way to ensure the wick stays in place and your fingers are away from the hot wax. 1. Candle Stubs – The easiest way to make a new candle is to cut up older, burned down candles, melt the wax and make a new one. Old candle stubs can also be used as a base with other candle waxes poured on top. 2. Broken Crayons – When I was a child, my church showed me how to do this and I never forgot it. To make a crayon candle, simply remove the paper from the crayons and place them in a container to melt such as a used metal coffee can, soup can, etc. Place the container in a pot of hot water (resembling a double broiler method) and allow water to come to a boil. Melt the crayons over medium heat. Pour into the desired mold and add a wick. Be sure that the wick is fairly centered and running the entire length of the container. Allow the candle to sit until it has hardened. On a side note, one fully in tact crayon will burn on its own for 30 minutes. 4. Vaseline – This economic, multipurpose prep is another household item that can be used as a makeshift. The vaseline candle will burn on it’s own for 30 minutes. As well, this method can also be used as an easy firestarter. All you need is some used foil, a cotton ball and some vaseline. To see directions for how to make this type of emergency candle, click here. If you don’t want to go to all the trouble of making your own wax. you can buy pre-made bayberry wax. Bayberry wax is very brittle, therefore, keep your candles small or make tapered candle sticks to ensure the candles stay in tact. I like the information on the bayberry. Remember it might pay you to stock some wicks, they are very inexpensive. Check the internet under candle wicks. Wow, I hadn’t heard all of these. I’ve shown my children a couple of alternatives in the past and will have to melt some crayons now and try the canned meat one. Two other ones that I’ve tried is a little oil in a shallow dish with a “wick” something like a strip of paper towel twisted and set in the dish with an end sticking out, also a birthday candle in a small can, like a tuna can, with rolled up cardboard surrounding it and wax poured into this. Probably not enough of a discription to try these, but they are also easy alternatives. You forgot one of the most ancient way of making a candle or lamp…OLIVE OIL lamp. You will only need a canning type jar, olive oil, a wick of some sort, and a piece of wire. See link below for complete (with picture) directions. hi sets, here’s a link to the emergency candles that ive made for around the house. these seem really fun to do and r good for an emergency like no electricity and u need light. THANKS FOR THE IDEA!!! Take an ordinary can of Crisco, remove the lid. Take an ordinary candle and cut its length to the height of the Crisco can. Push the re-sized candle down into the middle of the Crisco can until it touches the bottom. Light the candle. Volia! a 100+ hour candle. In a pinch, you can also build a solar oven from a cardboard box, a sheet of glass (from an old photoframe perhaps?) and some aluminum foil. There are plenty of tutorials online on how to build these, and even in winter the inside gets hot enough to melt wax. Its not the heat of the sun, but rather the radiation that does the job, so you’re good to go as long as its not too cloudy outside and you keep your cardboard box out of the wet snow. Making candles is so relaxing! I’m a candle maker newbie… I want to share something I found: a free email minicourse about candle making… 10 free email lessons and then they try to sell an ebook with a lot of free bonuses… they also teach you how to make it a profitable business… I found the free stuff very valuable anyways… http://www.leadvision.it/candlemaking4you/op.asp Hope it helps! You guys are idiots. Burning wool socks creates high levels hydrogen cyanide, which can be fatal if too much as inhaled, and minimal amounts can kill unborn children.